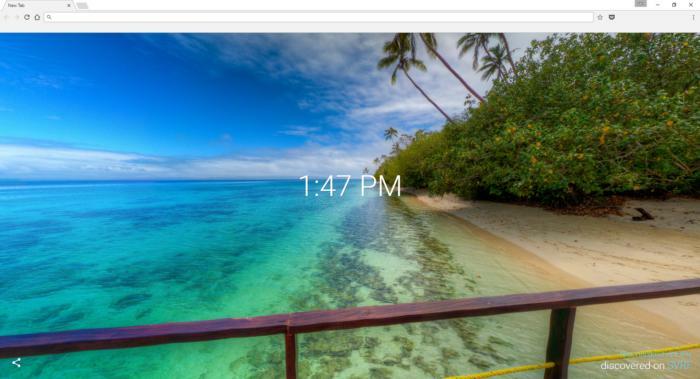 SVRF Tabs for Chrome puts 360-degree images on your New Tab page. I’m always on the lookout for interesting ways to spice up the New Tab page in the browser. The standard new-tab pages in Chrome and Firefox are useful enough, but they’re hardly beautiful things to look at. A great solution for anyone looking to add a little flair—especially if you’re a virtual-reality fan—is a new extension for Chrome called SVRF Tabs. Created by SVRF—a company focused on search and discovery for virtual reality—the extension supplies a 360-degree image when you open a new tab. You can get stunning images of the California coastline, a tropical destination, a Welsh town, and many others. Using the extension is pretty straightforward. Install it from the Chrome Web Store as usual (link above). Chrome prompts you to allow the extension to change your new-tab page. Once that's done, you’re all set. Now just open a new-tab page to enjoy 360-degree images that you can manipulate with your mouse. Most of the images used by SVRF Tabs appear to come from users on Flickr with links back to the original. There’s also a share button in the lower-right corner that lets you copy a link to the image, or share it on Facebook and Twitter. SVRF Tabs also displays the current time in the center of each image. SVRF Tabs offers a great selection of 360-degree images though it takes a few seconds for the image to load once you open a new tab. Once it loads, an image automatically starts rotating, allowing you to view it without using your mouse, if you prefer.